Updates made to Zenimax's suit against Oculus include accusations of theft against John Carmack and Palmer Luckey. Back in May of 2014, Zenimax (the parent company of Bethesda and id Software) filed a lawsuit against Oculus VR alleging that the VR company had used stolen Zenimax technology to create its Oculus Rift headset. Since then, Facebook bought Oculus, and the lawsuit fell off everyone's radar. But the suit is still active, and a filing last week has brought a very interesting amendment to the suit to light. "Instead of complying with his contract, during his last days at ZeniMax, he copied thousands of documents from a computer at ZeniMax to a USB storage device. He never returned those files or all copies of them after his employment with ZeniMax was terminated. 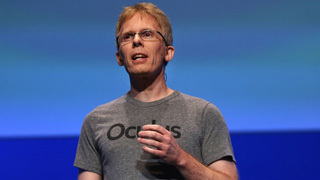 In addition, after Carmack's employment with ZeniMax was terminated, he returned to ZeniMax's premises to take a customized tool for developing VR Technology belonging to ZeniMax that itself is part of ZeniMax's VR technology." Zenimax also alleges that Oculus CEO Brendan Iribe falsely constructed the image of Palmer Luckey as the creator of the Oculus. "Oculus, at Iribe's direction, disseminated to the press the false and fanciful story that Luckey was the brilliant inventor of VR technology who had developed that technology in his parents' garage. In fact, that story was utterly and completely false: Luckey lacked the training, expertise, resources, or know-how to create commercially viable VR technology, his computer programming skills were rudimentary, and he relied on ZeniMax's computer program code and games to demonstrate the prototype Rift." Elsewhere in the amended complaint, Zenimax alleges that when Facebook was in the process of acquiring Oculus, Oculus falsely claimed that it had full ownership of its IP. Zenimax claims that, "At the time those representations were made--and at the time the acquisition transaction subsequently closed--those representations were false, Oculus, Luckey, Iribe, and Carmack knew them to be false, and Facebook knew or had reason to know that they were false." There's no request for a specific amount of damages in the suit at this point, with Zenimax saying that the amount will be determined at trial. "Defendants' misappropriation of ZeniMax's trade secrets has caused and will continue to cause damage to ZeniMax in an amount to be determined at trial." As you might imagine, Oculus has cast doubt upon the claims in the suit. The company has issued a statement in response to the reports of the amendment to the suit, saying, "This complaint filed by ZeniMax is one-sided and conveys only ZeniMax's interpretation of the story. We continue to believe this case has no merit, and we will address all of ZeniMax's allegations in court." There's obviously still a lot up in the air concerning this suit, and there's no word on when it might see the inside of a courtroom. It will eventually have to be resolved, but at this point it's little more than a he-said / she-said argument. If you want to see all the claims made in the suit, you can read the full 60-page document here. Disclosure(s): Oculus Rift hardware and games were provided to The Escapist by Oculus.